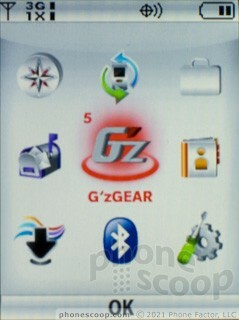 The Web browser on the Casio G'zOne Ravine is a simple WAP browser. It is sluggish and rendering quality is poor. The browser had trouble even loading the simple Verizon Wireless launch page, let alone more complicated HTML sites like our own PhoneScoop homepage. In extreme emergencies (finding a cure for a snake bite, perhaps?) 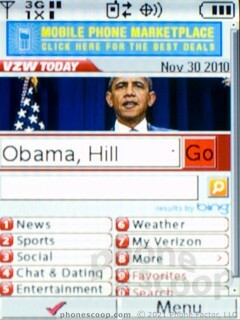 you could use the Bing search app, or try the mobile browser. But I would not rely on this phone for any kind of regular Web browsing habit. There are a number of ways that you can customize the menus on the Ravine. 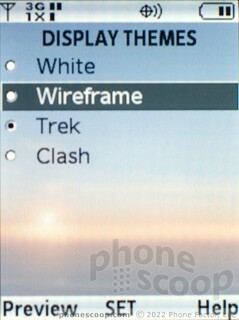 There are three preset themes to choose from, each with their own look and color scheme. You can use a small or a large font for the menus. You can choose from a few different clock styles, both for the interior clock display and the external screen. You can customize the large PTT button on the side of the phone. If you're not a PTT user, you can assign any app on the phone to that side button. 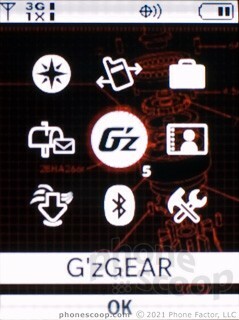 You can also customize the menu and some of the shortcuts on the phone. Like I said, you can replace four of the main menu items with your own picks, and you can rearrange the order of the 3 by 3 icon grid on the main menu screen. From the standby screen, the direction pad offers a shortcut depending on which way you press it, and you can customize these. Press the pad to the right, and you get a second shortcut menu with four slots that you can customize. There are layers upon layers of shortcut options.